The Central Institute of Medicinal and Aromatic Plants (CIMAP) bestowed SingSys with website development project. CIMAP is a responsible and important Governmental Institute in India and they found Sing Sys Software Services as most favourable option technically to get their website developed. The huge increase in number of users who are getting interested in areas of chemical and biological sciences has been acknowledged by CIMAP and they are looking forward to share and extend their research with such users on behalf of industry ready website that is responsive and user-oriented. This project covers complete development of the website to smartly manage and capture important insights earned after spending long hours in the laboratory. 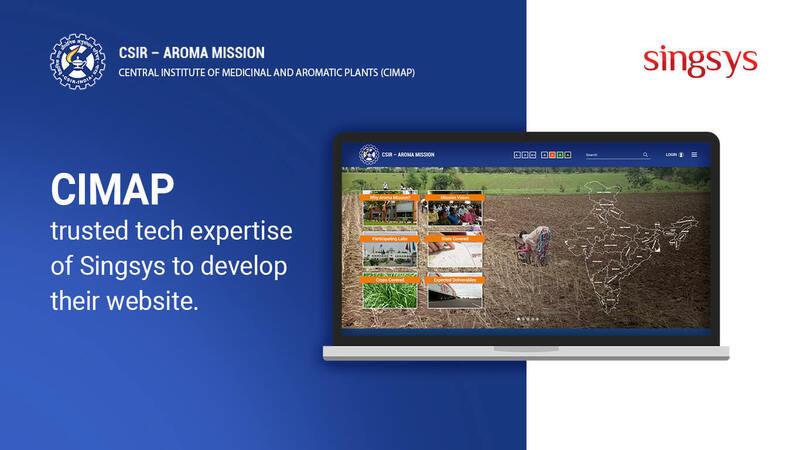 CIMAP primarily focus is towards systematic generation of high-end research intended for helping the country towards implementation and industrial processing of Medicinal and Aromatic Plants. In order to make the information easily accessible which can be easily grasped by general user and entrepreneurs. CIMAP required a website and SingSys promised to collaborate with them. CIMAP is a high quality research oriented institution under Government of India that was began its operations in 1959. The purpose is to research and capture substantial information on behalf of well established scientific theories and encourage the implementation of medicinal and aromatic crops. SingSys web app development team consists of experienced and certified developers who willingly accepted the responsibility of establishing CIMAP web presence and connect them to even greater audience. The company hold legacy of partnering with Fortune 500 companies as well as developed ENVIS-NBRI- Green Planner app to fight air pollution successfully. We deliver industry oriented solution to suit client expectation and objectives. About Sing Sys Software Services: It is an established entity in ever expanding arena of mobile, web and e-commerce solution development. Headquartered in Singapore with its offshore arm in India. The SingSys is hub of dedicated developers who are passionate about leveraging the industry trends and implementing it to best in all the projects. This is an effective way to engage customers in this highly dynamic and diverse environment.